KIM (KDE Image Menu) is a third party plugin for KDE to add context menu (the right-click) able to do convert and resize to image file. KIM is very useful because it adds those convert and resize options into the right-click in Dolphin when you browse image files. It can do those manipulations to both every single image and many images simultaneously. Just click and done. This article introduce how to install KIM in KDE 5 because it needs special treatment compared to KDE 4. KIM is free software and licensed as GNU GPL 2. Download KIM for KDE 4 from http://kde-apps.org/content/show.php?content=11505&forumpage=15. You will get an archive file named more or less kim4-0.9.5.tar.gz. We use KIM 0.9.5 version because at this time there is no version for KDE 5. Extract it in you $HOME directory (to make it easy). You should get a folder named kim4 later in your $HOME. So the path address for it is ~/kim4. Explanation: KIM installation is essentially just to place the .desktop file into KDE ServiceMenus directory and to place the KIM shell scripts into /usr/bin/ directory. 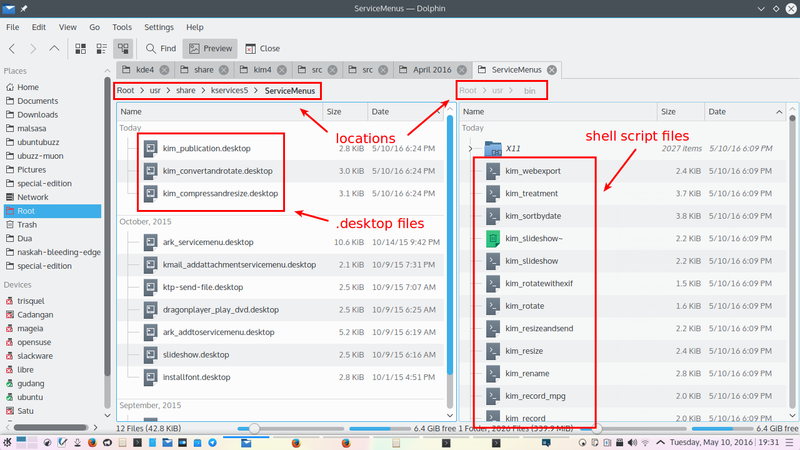 The only one problem between KIM and KDE 5 is around KIM installs the .desktop files into KDE 4 ServiceMenus directory, while KDE 5 has different location for ServiceMenus. So the first command did the job for KDE 5. ServiceMenus more or less is a directory containing .desktop files associated with every single right-click menu in Dolphin. See picture below. Explanation: those six commands do creating directory and placing the correct file to the corresponding directory. Right-click to any image file (JPEG, PNG, GIF, etc.) see Actions > Compress & Resize and see Actions > Convert & Rotate and see Actions > Treatment. I'd like to say thank you to KIM developer Charles Bouveyron because I use it for years and truly it helps me a lot. and to DanielBull for showing how to install KIM in KDE 5.